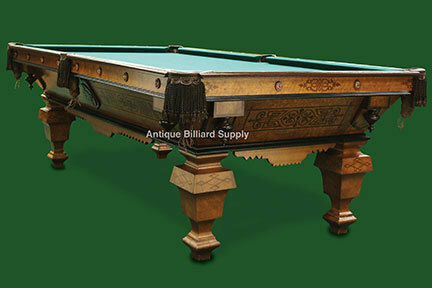 #3-09 Very old Brunswick antique pool table with Victorian design elements. Figured maple cabinet with chestnut brown finish as seen on many H. W. Collender antique pool tables of the 1870s. Rosewood inlay in geometric design. Ebonized turnings used as accents at each corner of the cabinet. Nine-foot regulation size, four-piece slate playing surface. Completely restored, ready for immediate delivery.